Dimensions to DIN EN ISO 463, issue June 2006. 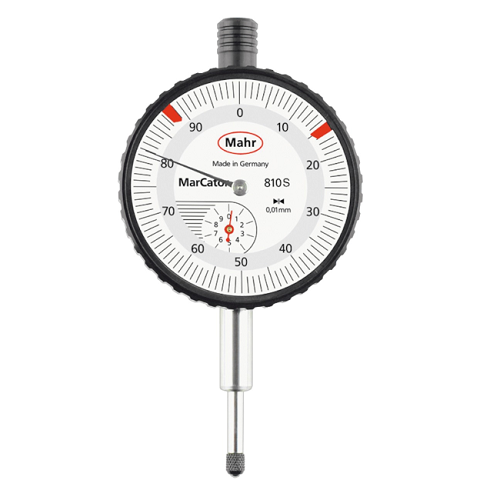 Shock-resistant precision dial indicators. Clamping shank ⌀ 8 mm h6, hardened and ground. Outer ring of dial face can be rotated to zero the dial. Outer ring with 2 adjustable tolerance pointers. Central pointer for 1/100 mm reading, small pointer on sub-scale for 1 mm reading. Shock-resistant by rack sleeve. Chrome-plated protective casing with integrated back. Special contact points No. 434900 / 4910 / 4915.